It's my birthday, and I can cry if I want to. It is not looking like I will be able to photograph the concert I am attending tonight: Sharon Jones and the Dap Kings at The Apollo Theater. Alas, I am more than excited about the show, and this band is worth promoting. With three extremely strong albums having lined their road to success, their newly released "I Learned the Hard Way" is yet another smash. The personal favorite in my household is their third: "100 Days, 100 Nights", released in 2007, but the newest record is getting the most hype, and for good reason. "I Learned the Hard Way" features more heartbroken lyrics than we have ever heard Sharon sing, but she handles it with the same familiar sound wave of passion. With a fiery voice she belts out songs about "Money" or lack thereof, and that she has "Better Things" to do than to remember you. The music blends Motown rhythms and sounds, while creating an entirely fresh medley of soul, hip-hop, funk, and jazz. Nothin' quite like this band. Having followed Sharon Jones and the Dap Kings for years, it is rewarding to see them hit some spotlight. They were recently featured in the opening credits of the Oscar-nominated film, "Up in the Air", with their version of "This Land is Your Land" off of the jivin' 2005 album, "Naturally". Next came Starbucks, their newest album landing in the perfect place of the hip coffee drinkers and music lovers nationwide. And now, best of all: they are on tour. More shows lined up than I have ever seen for them. 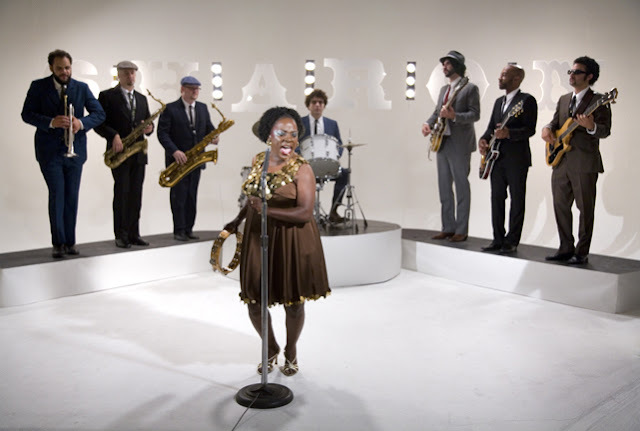 Check out Sharon Jones website for tour dates and to listen to the music. I promise it's good.